The above info came from Who Wants to Know?, and was edited by yours truly (contact me). The image came from JASMS 144. There are some very peculiar facts concerning this woman who claims to be known as Juliet Douglas, secretary for Fuhrer King Bradley. 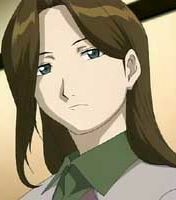 For one thing, she is a dead ringer for the late Trisha Elric. Second, as Sciezka discovers, the records say conflicting details: that she died two years before the Ishbahl war (15 years since), yet is listed as the cause of the war--and is still listed as active duty today--and she only appears to be in her thirties. It's only later that we start to piece together some of the facts. Juliet Douglas (at least, her present incarnation) is in fact Sloth, one of the Homonculi created as a result of failed human transmutations. Knowing that, and later understanding the origins of Homonculi, it becomes obvious how Sloth came to be. In the sixth manga, during a flashback, it is revealed that after the failed attempt, Pinako buried the body/thing found in the Elric brother's house. 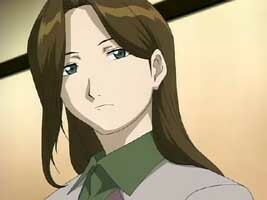 As Trisha Elric, she had been pretty much your average mother. Little else is known about her life prior to "that night" except that she had been secretly harboring a lingering illness, waiting for her husband to come home...and she eventually died of the illness. Ed and Al then studied alchemy and attempted to revive her...and the rest is well known. What wasn't really known was what happened to the shapeless mess that resulted in the transmutation. She had been abandoned after Ed and Al's failed attempt, but she eventually completely formed--perhaps with help from Lust and others. She's now allied with them and has been called Sloth, the seventh Deadly Sin. Sloth is amorphous. Her body is composed entirely of fluid, though she can assume the shape of Trisha Elric easily enough. Still, being entirely fluid, her body can flow itself as needed. She's shown that she can suffocate people by intruding herself into their airways, and she managed to incapacitate an angry Wrath by enveloping him with her fluid body (the fact that Sloth was once Trisha Elric has an odd effect on Wrath--probably because he has the arm and leg Ed gave up three years ago). Being composed entirely of fluid, she is most powerful when she is in the water, able to move at incredible speeds as well as maneuver the water itself to her own ends. Sloth's presence is a source of worry for Al, since he realizes she's a homunculus, who she once was...and most importantly, what it will take to stop her. And it will involve a lot more than just a physical journey. Juliet Douglas is really a Homunculus by the name of "Sloth" and is Secretary of Fuhrer Bradley. She appears right before Maes Hughes is murdered and later is seen with Lust and the other Homunculus. The Ishbal Rebellion began when someone shot and killed an Ishballion child. It is later found out that Juliet Douglas is the one who shot the child. She is killed by Ed when he transmuted her into ethanol, causing her to evaporate. The above description came from Colhan3000 and Jeramine Williams, and was edited by yours truly (contact me).